Fibromyalgia is a disease that causes widespread muscle and joint pain and can be categorized as either a musculoskeletal disease or psychological disorder. The cause of the disease is still unknown, and many researchers have postulated many causes, ranging from genetics to environmental factors. Stunning new evidence suggests that fibromyalgia may be associated with central nervous system (CNS) dysfunction that could be detrimental to future brain function. Researchers at the Society For Neuroscience performed a study comparing the brains of 10 female fibromyalgia patients with 10 healthy brains. Research showed that the fibromyalgia patients had 3.3 times greater age-associated decrease in gray matter than healthy controls. These numbers increase to a 9.5 times decrease each year the patients continue to suffer from fibromyalgia. How does Fibromyalgia cause aging? 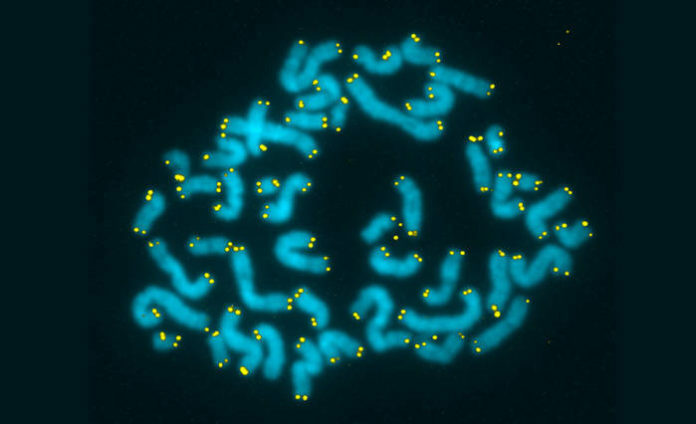 The chromosomes in the picture above have their telomeres highlighted in red. 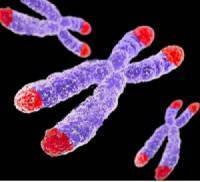 Fibromyalgia has also been linked to shortened telomeres, which are nucleotide sequences (compounds that create amino acids) found at the end of each chromosome, carrying our “DNA code”. As our telomeres shorten, they produce incomplete copies of our DNA code within newly formed cells, leading to lesser-quality cells than previous ones. This process is theorized as one of the major factors in what causes us to age. When researchers compared the telomeres of women with fibromyalgia to those of healthy women, they found that the telomeres belonging to the women with fibromyalgia tended to be shorter, showing an average aging equivalent of +6 years. They also found that shorter telomere length was associated with lower pain tolerances and an increased likelihood of depression. To battle brain aging in patients, there are a number of supplements one can take that promote healthy brain function. A diet high in Omega-3 and other fatty acids, iron, and vitamins B12, D3, and C can aid in slowing the aging process on a cellular level and may possibly reverse some of its effects. (This is not an FDA-approved solution, however, and studies are still being carried out to determine their efficacy. If you have fibromyalgia and are concerned about your brain health, talk to your doctor about what supplements are safe for you. Some vitamins or minerals may interact with your prescribed medication or other condition(s), so it’s best to let your doctor know what you are considering taking in addition to your daily regimen. Your doctor may also have additional suggestions for maintaining your brain health. I am still unsure what it is that I have but Fibromyalgia is very prevalent in my family. My whole body aches and nothing seems to make it better. Does anyone have any suggestions because I work full time and it is,becoming very difficult. I believe it does not show up in bloods so you have to go to a Specialist. This in itself is a slow process what can I do in the interim? 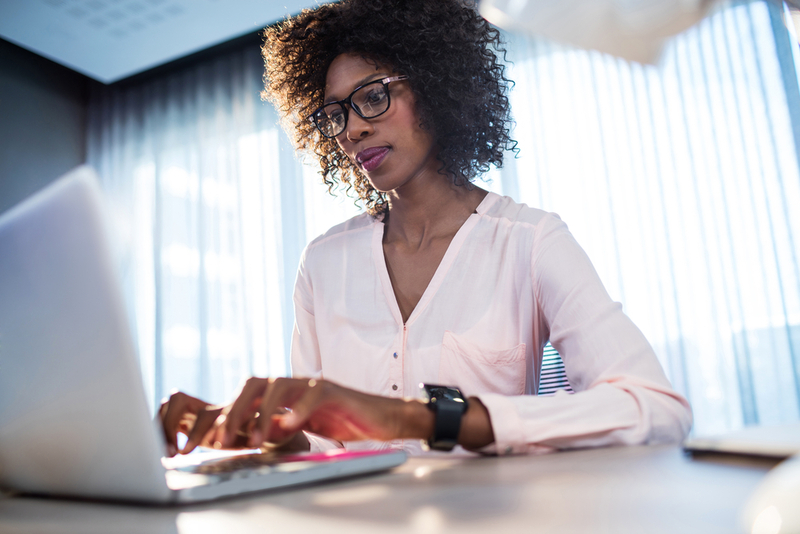 Working when you have a chronic condition like fibromyalgia can be very difficult. To exchange ideas and support with other members, please visit forum.painresource.com. I think you’ll find this community to be very helpful and supportive. Hi everyone, I am truly sorry to hear everyone has fibromyalgia, it’s very hard to mentally and physically deal with. I also have Fibromyalgia, it took three and a half years to diagnose my condition. The pain started out in my feet, traveled to my hands, arms and legs, worse being in my legs and feet. I wake up in the morning walking like I am ninty years old, I’m only fifty. I take Tramadol for pain, it takes the worse pain away, but it’s still there. Doctors might look at you as though your crazy, saying it’s anxiety when it’s not. You know your body, don’t give up. It can run in the family, my mum has it too. Bless her! Thanks for taking the time to share your experience and words of encouragement. We’re sorry for the difficult times you’ve faced, and admire your strength and determination. We’d love to have you as a member of our community. Please visit forum.painresource.com to join.